On USC Dornsife Week: Not all big ideas are about big things. Moh El-Naggar, professor of physics and astronomy, discusses how something small could help us think big. Moh El-Naggar is the Robert D. Beyer Early Career Chair in Natural Sciences, and Professor of Physics, Biological Sciences, and Chemistry at the University of Southern California Dornsife College of Letters, Arts and Sciences. As a biophysicist, El-Naggar investigates energy conversion and charge transmission at the interface between living cells and synthetic surfaces. His work, which has important implications for cell physiology and bioelectronics, may lead to the development of new hybrid materials and renewable energy technologies that combine the exquisite biochemical control of nature with the synthetic building blocks of nanotechnology. 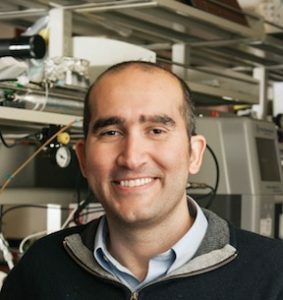 El-Naggar was awarded the Presidential Early Career Award for Scientists and Engineers (PECASE) by President Obama in 2014. In 2010, El-Naggar received a Department of Defense Young Investigator Program (YIP) Award, from the Air Force Office of Scientific Research. In 2012, he was named one of Popular Science’s ‘Brilliant 10’, the magazine’s annual honor roll of the 10 most promising young scientists whose innovations will change the world. More information about El-Naggar’s research can be found at http://nanobio.usc.edu. When most people think of microorganisms, like bacteria, they think of the ones that might make you sick. But that is actually a small slice of the microbial world. What if microbes, the oldest and most successful inhabitants of our planet, present the solutions to humanity’s most pressing problems? My research team studies electric bacteria. Each of these tiny cells, about a hundredth of the width of a human hair, can pull off an amazing trick. As part of their metabolism, they move electrons from the inside of the cells to surfaces outside the cells. Just like we humans breathe oxygen, electric bacteria evolved this trick to ‘breathe rocks’ in environments like deep under the Earth’s surface. My lab uses advanced imaging and electronics to understand the molecules responsible for these ‘electron conduits’ that link the living world – bacteria – to the non-living world of rocks and minerals. Remarkably, it turns out that we can also take advantage of these conduits to wire up bacteria to metal or semiconductor technologies to extract renewable energy, make biofuels, or build new bioelectronics. With these discoveries, it is becoming possible to build biological batteries and fuel cells where bacteria treat waste and convert it to electricity. It’s also becoming possible to reverse the process, inject electricity – like from solar panels – into microbes that capture carbon dioxide and make biofuels. More recently, we started pushing the envelope to ask whether we can build new technologies where living genetically programmable cells fabricate or plug into more traditional electronics that you’re familiar with – living electronics, if you will. Our work underscores how curiosity-driven research has powered practical innovations. And when we think about the biggest problems of energy and sustainability, sometimes we might want to look at the smallest solutions possible.